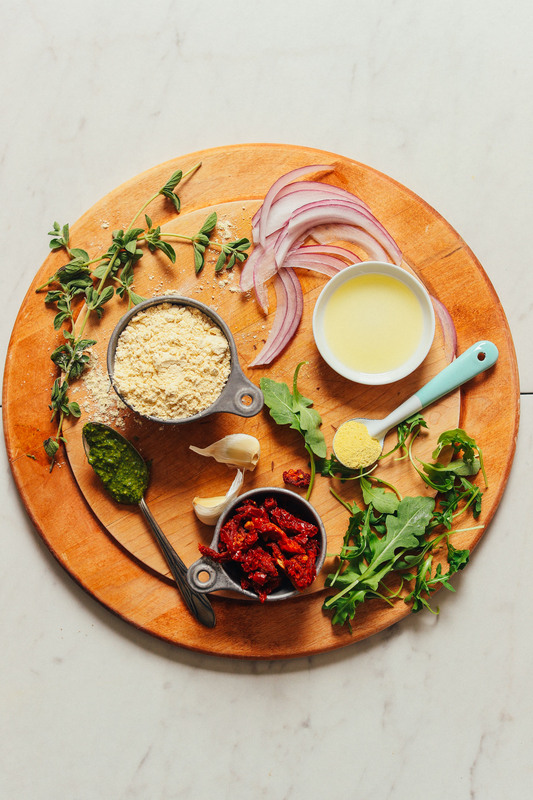 Now that we’ve discovered how delicious socca is, let’s make pizza! This recipe requires just 10 ingredients and 1 bowl to make and comes together in about 1 hour. 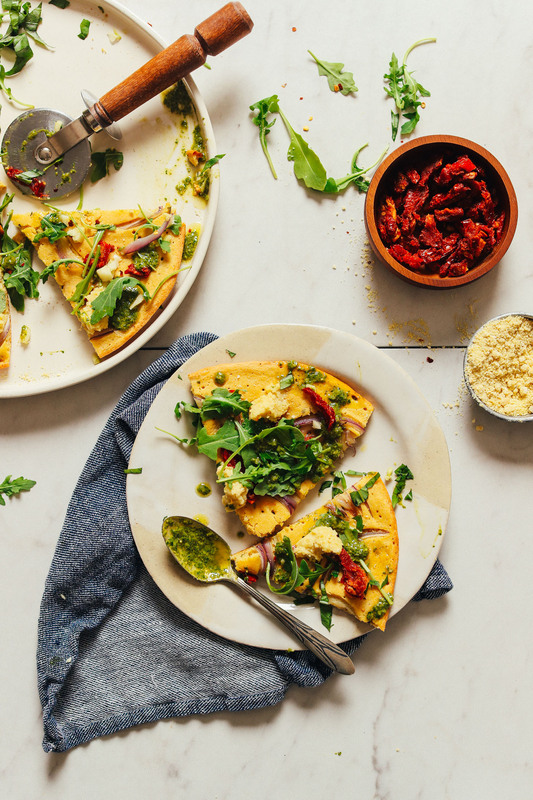 The reason I love this recipe so much is it’s like eating pizza but without all the bread and grains. That’s right, it’s grain-free! It starts with socca batter infused with garlic and nutritional yeast for flavor (oregano is optional!). Baking powder provides a little rise, but not so much that the edges don’t get browned and a little crisp. For toppings, we went with red onion, sun-dried tomatoes, vegan macadamia nut cheese, and vegan pesto. But really, whatever you have on hand will work! This pizza would make the perfect appetizer on Italian night or even the main event when paired with a green salad like this Loaded Kale Salad! 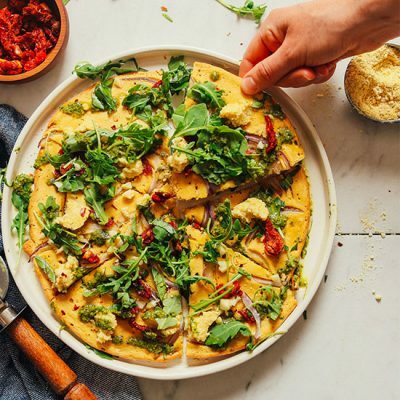 If you’re into pizza, be sure to check out our Mini Portobello Pizzas, Mini Eggplant Pizzas, Vegan Deep Dish Pizza, My Favorite Vegan Pizza, or Butternut Squash Veggie Pizza! 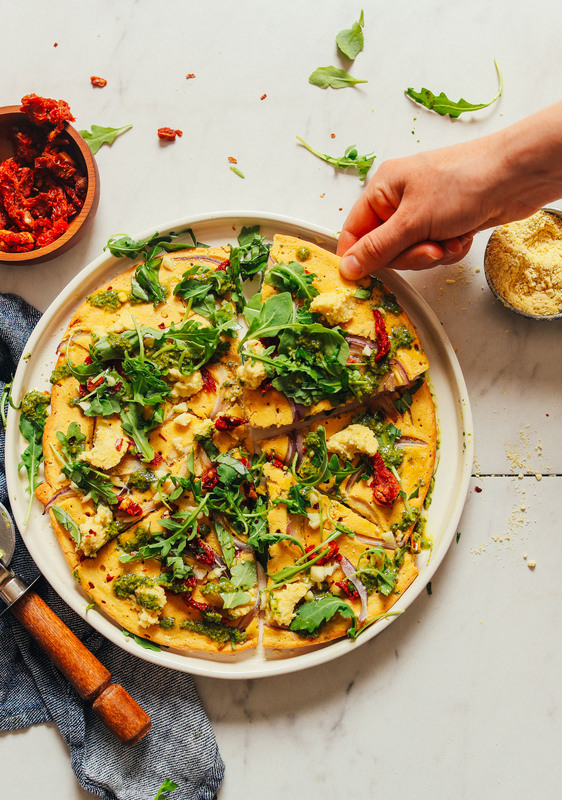 A grain- and gluten-free alternative to traditional pizza with chickpea flour crust, vegan pesto, and sun-dried tomatoes! Just 10 ingredients required! 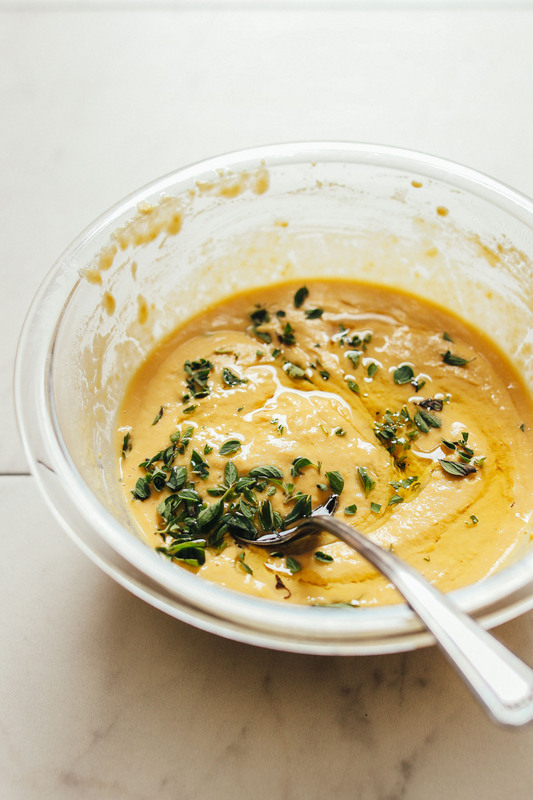 In a medium mixing bowl, add garbanzo flour, sea salt, baking powder, garlic powder, and nutritional yeast and whisk to combine. Then pour warm water into dry ingredients and whisk until smooth (add the water slowly, and if it starts to look too runny - it should be a thin but not a watery crepe-like consistency - refrain from adding all the water). Cover and let rest for 30 minutes. In the meantime, heat oven to 425 degrees F (204 C). Once the batter has rested, add the olive oil and oregano (optional) and stir to combine. Heat a large (12-inch) oven-safe cast-iron or metal skillet over low-medium heat (if using a smaller skillet, this will make two small pizzas instead of one large pizza). If using a non-stick pan or a cast-iron that's seasoned, it shouldn’t need more oil. But if your pan tends to stick, add a little oil - it won’t hurt. 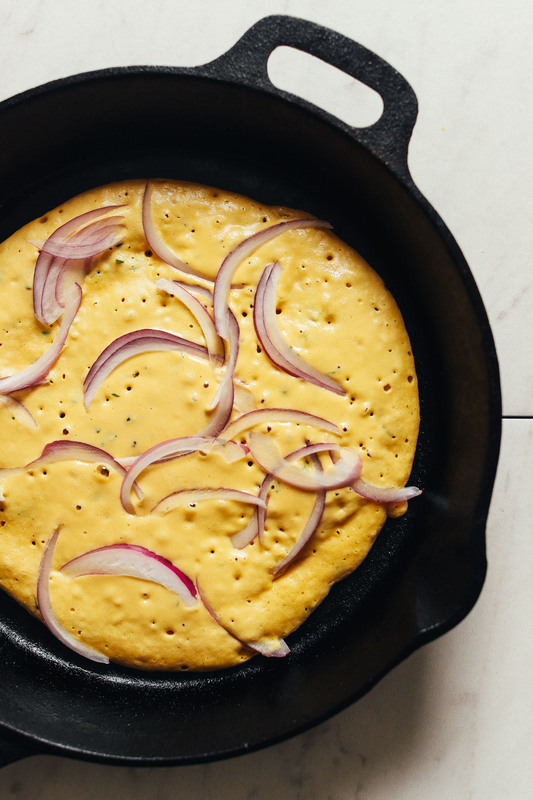 Add the chickpea batter into the greased, hot skillet and move the pan around to allow batter to flatten like a large pancake, leaving a little room on the very edges of the pan to allow room for a spatula to slide under. Add onion and cook for 1 minute. Then carefully transfer skillet to the oven and bake 10-15 minutes or until bubbles have formed, the edges have browned, and the top is slightly golden brown. Remove from oven after baking, gently loosen with a spatula, and slice on a cutting board (or slice right in the pan). Then add remaining toppings of choice. We went with chopped sun-dried tomatoes, macadamia cheese, arugula, raw chopped garlic, and vegan pesto. Vegan parmesan and/or red pepper flake can also make nice additions. Best when fresh. Store leftovers in the refrigerator up to 3-4 days. Reheat in a 350 degree F (176 C) oven until hot (arugula does not reheat well). *If using fresh tomatoes instead of sun-dried, add to the socca when adding the onion so they bake into the crust. *If using a store-bought shredded cheese instead of fresh nut cheese, add to the socca when adding the onion so it has a chance to melt and bake into the crust. Find the recipe for the Macadamia Nut Cheese here. This socca pizza is so freaking good! I love how fluffy it is! I even cheated and only let the batter sit about 18 minutes but it was still great! My only adjustment is: I would probably do a scant or flat 1/2 tsp of salt (instead of heaping, as the recipe is written) but otherwise it was perfect. I put kite hill chive cream cheese on top, sun dried tomatoes, spinach, and kale pesto. My family actually enjoyed it. The recipe was enough for everyone to have 2 slices (serving 3 people)on the side of some fresh salad at lunch. I’ll make this again! I don’t like seeing the italics (), all the time, so when l copy any recipe, l change it to the format, l and my friends have used for 30 yrs. l love a lot of your recipes btw! This recipe is wonderfully flexible! I cooked the crust in a nonstick pan, flipping halfway through to get both sides, and then transferred it to a baking sheet, topped it with some pizza toppings, and finished it in the oven for 10 mins. It makes two 8″ personal pizzas. I also used the dry mix base (minus nutritional yeast, oregano, garlic powder) for a pancake batter and my kid loves it! Added chopped apples, nuts, coconut flakes. I’ve also used this to make flatbread to accompany Indian food. Added curry powder. Oops….forgot to rate the recipe when I commented above. I loved it! Great easy gluten free option! Thanks for another tasty recipe! Didn’t have cast iron fry pan so oiled my cookie sheets instead. Started checking cook time at 7 min (cooks way faster). Turned out great! (rustic shape too). Doubled the recipe so had 1 pizza & 1 flatbread. Great idea! Thanks for sharing, Sharon! Can I leave out the baking powder? I wouldn’t recommend it as it helps with rising. I’ve made this twice now, last night for dinner and today for lunch because we just had to have it again! 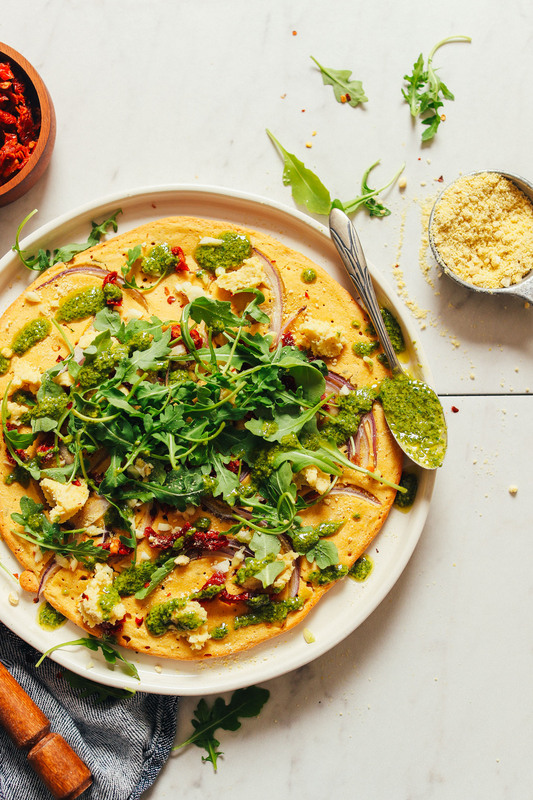 This socca bread is sooooo good and so versatile! We absolutely loved it! So much better than any other GF pizza crust, too! YUM! Thank you Dana! Do you think there’s any issue of making this dough the night before? You mention to let it rest for 30 minutes. Would it possible to just pop it in the fridge in the evening and make it the next day for lunch or dinner? I think that would be fine! If it gets super thick, just thin with a little more water. Good luck! Hmm it sounds like more water would have helped! Nice recipe, I’m in the process of cooking it. Would you recommend any other flour? I don’t carry that one in my country. Hi Anabella! We haven’t tried it with other flours but if you experiment with it, we’d love to hear how you make out! Made this tonight for the first time & loved it (especially the fact that the pizza dough didn’t hurt my tummy!!). Didn’t have fresh oregano so subbed dried oregano & basil, & dried sundried tomato’s. I’ve never made Socca before & I envision using the recipe without toppings to go with homemade soup etc. Always save your recipes – I love your descriptions prior to the recipes! Made this for the first time last night and it was a winner. Instead of trying to transfer to a cutting board after baking, I just left it in the cast iron to cut/serve. Mine was still just a bit soft in the middle after only 10 min in the oven so I’m not sure it would have held up. I’m not vegan, so used regular cheese and popped it back in the oven for just a minute after baking to melt the cheese before adding arugala. Also made a mini in a 6” cast iron for a friend who doesn’t eat dairy. 1/3 of the recipe worked perfectly. What is the benefit of the oil? I am trying to be oil free and wondering what I may “lose out on” not using the oil. Thank you! The oil helps prevent sticking and adds additional flavor. Hope that helps! Ahhhhh! Thank you! Stoked I never have to make cauliflower pizza crust again because I have this now amazing go-to that is so much less messy. So many thank yous ! Yay! Glad to hear it, Sarah! I tried it again and I put a tsp (not tablespoon) of dried oregano instead. Other than that, I followed the recipe exactly. It still came out dry and had the same chemical taste to it. I wish I knew why. Thanks, Elle! Love the addition of a balsamic drizzle! Brilliant. xo! This was amazing!! I followed the recipe as is but used shallots instead of red onions and added some dried oregano to the batter rather than fresh. Delicious! It should. Just make sure it’s well oiled. I don’t use my stainless steel much either! They stick to pancakes as well. Hi! Could you possibly make a “cornbread” version of this by subbing half the garbanzo flour for cornmeal? Hmm, perhaps! Let us know if you give that a try! Lovely, thanks for sharing, Aryana! Made this last night, was a winner. I added my own toppings, cooked some mushrooms and added them into the mix. I didn’t use vegan cheese, only the cashew nut cheese, adding avocado and some artichoke, was delicious. Second batch I made the crust much thinner since my son prefers a thinner crust and I added more nutritional yeast – it was amazing. I love your recipes, you keep me inspired and in the kitchen (which is not my most favorite place to be) best part is that your recipes are healthy! Winning combination. Thank you! So great!! Thanks for sharing, Tracy! I love this! I noticed natural cracks in the socca when I made it.. is there anyway to avoid this! Thank you!! Hmm, that is pretty natural and I wouldn’t worry about it! What recommendation would you have if I don’t have a cast iron or oven safe skillet? Can I use a glass dish? Metal pie pan? Can you make this using your stove top only? I think so, yes! Once it’s cooked for a couple minutes on higher heat, turn heat to low, cover and let it cook until no longer doughy. I love your site! Thank you for all the healthy recipes. 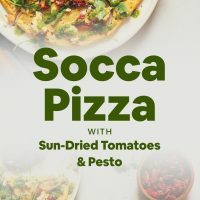 This is a little off topic, but what is the music for the video for the socca pizza? I Shazaamed it but it did not find a result. I look forward to making this! Hi there! I’m not sure! We use a music licensing site and I don’t save all the titles. Sorry!